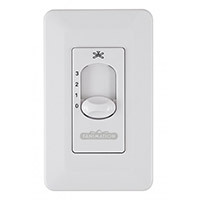 We invite you into a world of fashionable fan accessories with these Wall Control switches. Truly refreshing—these control switches are a departure from the traditional, circular speed designs that have become so predictable. These urbane-fashioned controls offer a serious artistic value and make the entire décor look more sophisticated. Options include control panels with dedicated fan-only controls and those offering a blend of fan & light controls. Compact, sturdily built and immune to everyday wear & tear, these wall controls easily blend into the ambience. Our exclusive networking in the home décor and lighting industry ensures you get the latest fan wall controls at the best online prices. Fan Wall Control There are 8 products.